We love local food. But we also love other culture food. Everybody knows that italian people have an admirable way of living and their food is a good example of that. In Eixample Esquerra has recently openend a new winery and panini bar, called Bodega Santo Porcello, which has become one of our favourite places in the neigborhood. 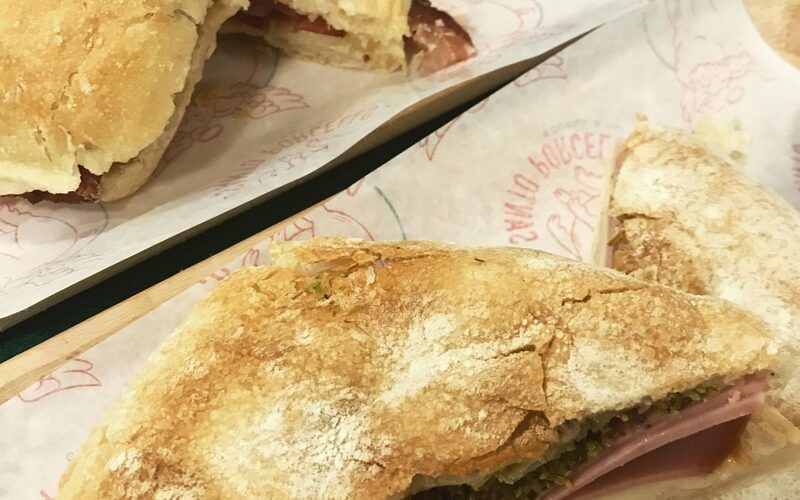 This small bar has perfect italian paninis and it is difficult to choose on of them. The one with Italian mortadella and pistacchio is just delicious. It is fantastic having a panini while listening to Italian music. Santo Porcello it’s a must if you are hungry while you are visiting The Eixample! Spacious, bright and quiet 100 sqm apartments Barcelona for up to 6 people, recently renovated and tastefully designed in a modern style. 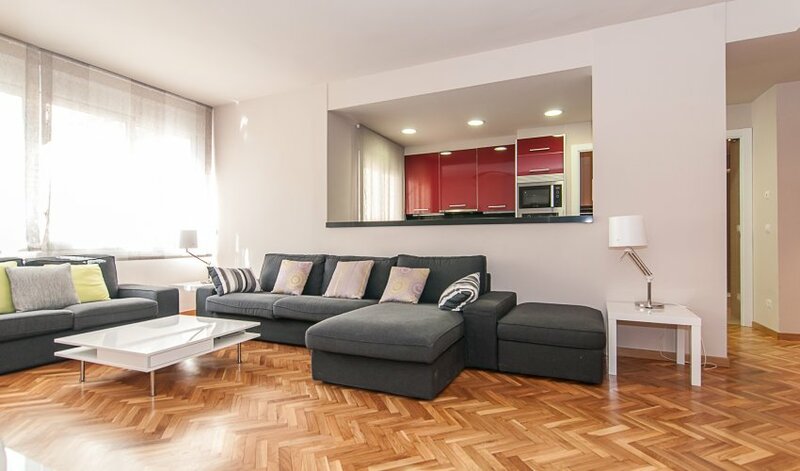 The wooden floors and modern decoration give this apartment a homely atmosphere. The living room is spacious with a big comfortable sofa, coffee table and modern TV. An ideal place to relax and spend some nice moments with your friends or family after a long day of sightseeing. The lovely modern American kitchen is connected with the living room and fully equipped with fridge, oven, microwave, dishwasher, washer dryer , and all the necessary utensils so that you can prepare your own meals and enjoy them on the beautiful modern dining table with 6 chairs. 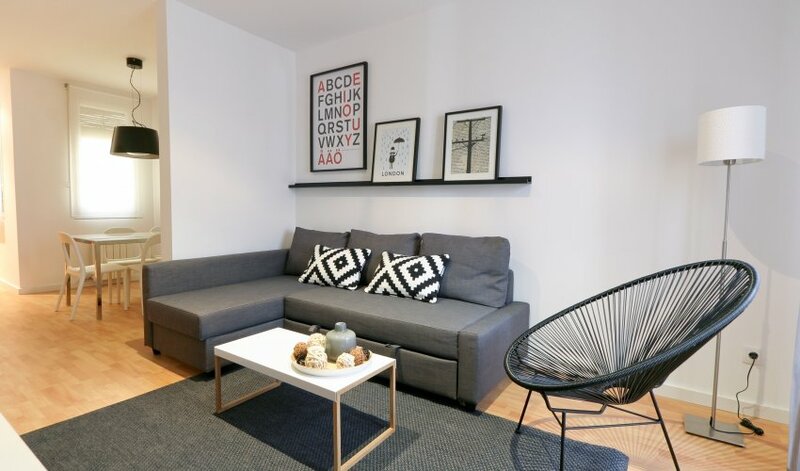 Nice and cozy 85 sqm short term rentals in Barcelona for up to 6 people, recently renovated and tastefully designed in a modern style. The sleeping facilities consist of three bedroom. The master bedroom has twin beds, ensuite bathroom with bathtub and a big closet. There is another small double bedroom also with ensuite bathroom and next to it there is the single bedroom. The spacious and comfortable living room has a sofa bed suitable for two more guests and access to a sunny balcony. Fully equipped kitchen with fridge, oven, microwave, dishwasher, washer dryer and all the necessary utensils so that you can prepare your own meals and enjoy them on the beautiful modern dining table with 6 chairs. Bright and spacious newly renovated and furnished apartment, located in a beautiful classical building in the Eixample district of Barcelona. Three quiet bedroom, two doubles with twin beds and one single. The spacious living room has a living area with sofa bed and TV and dinning area with table for six people. Two full bathrooms with bathtub and fully equipped kitchen (oven, dishwasher, stoove). Other facilities in the apartment are: Air conditioning in the living room, fans on the ceilings of the bedroom, balconies in both the living room and the bedroom. Quiet, comfortable, cozy and in perfect condition! 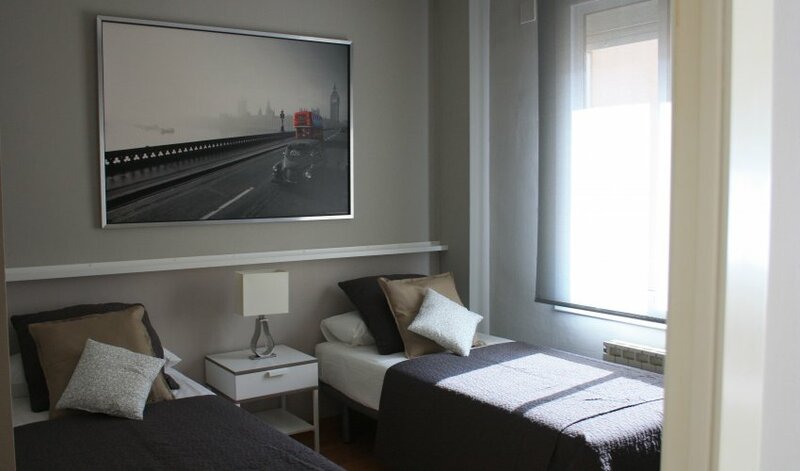 a good alternative for accommodation in Barcelona.